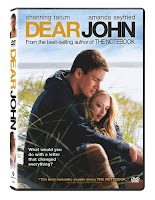 This week's chosen DVD is Dear John. Limited choices this week, but the the adaptation of Nicholas Sparks' latest romantic fare Dear John is enough to tide viewers over for a week. Amanda Seyfried joins with Hollywood hunk Channing Tatum as two 'caught in the moment' lovers, with Tatum's duties to the war tearing them apart. Keeping in contact traditionally by letter, the two write back and forth. But will their love be strong enough? Hardly straying from Sparks' own style, the film never particularly appears sugar coated. The story never truly falls saccharine, merely realistic in relationship terms. Seyfried and Tatum have terrific chemistry, making the film all the more believable. A DVD purchase is perfectly fine. Jude Law and Forest Whitaker team up in Repo Men, a macho action romp about two friends whose job entitlement of reclaiming artificial organs proves too much once Law's character is fitted with one himself. Straying from the company's wishes, Law teams up with an outlaw to escape the repo men after them, willing to do anything and kill anyone to stay alive. While the premise is promising, it never fully lives up, with writing failing to induce any sort of realism in the characters and the situations which occur. A wasted opportunity, with Darren Lynn Bousman's Repo: The Genetic Opera proving a substantial amount more interesting.